Perfect PDF 9 Converter allows time-saving PDF creation, in the office or at home, and is the right program for PDF beginners. Further functions are printing and signing of PDF files, features to rearrange the document structure (move, remove, resize and rotate pages) and to annotate PDF documents using text notes, markup or pen. You can also create PDF documents from text or image files and insert pages from image files or scanned images. A viewer for PDF or XPS files is also included. iVoicesoft Giveaway offer Perfect PDF 9 Converter for free download. 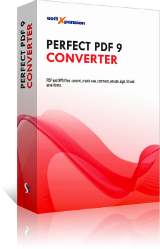 Perfect PDF 9 Converter may be only available to FREE download in published day, 15 Apr 2019. Next day, we will offer new Giveaway. Check it now! If you missed this giveaway please subscribe to our mail list for notification in the future.